While National Media (my favorite publication) may apparently believe that Washington will beat Alabama because Alabama is overconfident, most observers are giving the Huskies little chance in today’s College Football Playoff semifinal, the Peach Bowl. To the extent people think Washington can compete with Alabama, it’s mostly because of Chris Petersen‘s bowl track record, including wins over Oklahoma and TCU in two previous major bowl games (both the Fiesta Bowl). In this week’s episode of The Fabulous Peltoncast, which has a full preview of the matchup with Alabama, I took a look at whether this notion is grounded in reality. Let’s take a closer look at the numbers I cited. 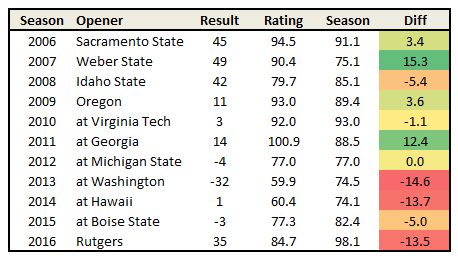 On average, Petersen’s teams have played about two points per game better in Bowls than over the course of the regular season. Much of that difference, however, is attributable to a 32-point drubbing of Arizona State in the 2011 Maaco Las Vegas Bowl. The Broncos did outplay their season rating to beat TCU in 2009, but remarkably, season-long ratings suggest they should have beaten the Sooners more comfortably in the 2007 Fiesta Bowl than their dramatic overtime win. The idea of Petersen’s preparation also extends to season openers, including wins in enemy territory against Georgia and Virginia Tech in showcase games on national TV and a home victory over Oregon. There, the evidence is even more mixed. If anything, season openers have been some of the worst games for Petersen teams recently. His last Boise team was crushed by UW in the first game at renovated Husky Stadium, and his first two Washington teams got a narrow win at Hawaii and lost back in Boise. Even this year’s 35-point win over Rutgers was relatively unimpressive given the way the two teams played the rest of the season. So on average, Petersen’s teams have been 1.7 points per game worse than overall in openers. Ultimately, I don’t think there’s anything special about Petersen’s track record with time to prepare — at least not compared to his overall track record. The fact is Petersen is good with a week to prepare and a month to prepare. And it’s that overall ability (the Huskies rank second in the nation by ESPN’s Football Power Index efficiency ratings, 3.2 points behind Alabama) that gives UW a chance to compete, not the time before the game. This entry was posted in huskyfb. Bookmark the permalink.